A person’s neck area is often problematic and can be one of the first areas prone to show signs of being overweight or the ageing process. No one “likes” the look of having a double-chin. Surgery is not the remedy most people seek first. There are other treatments to help you get the smooth, youthful neck with an even skin tone you are seeking. 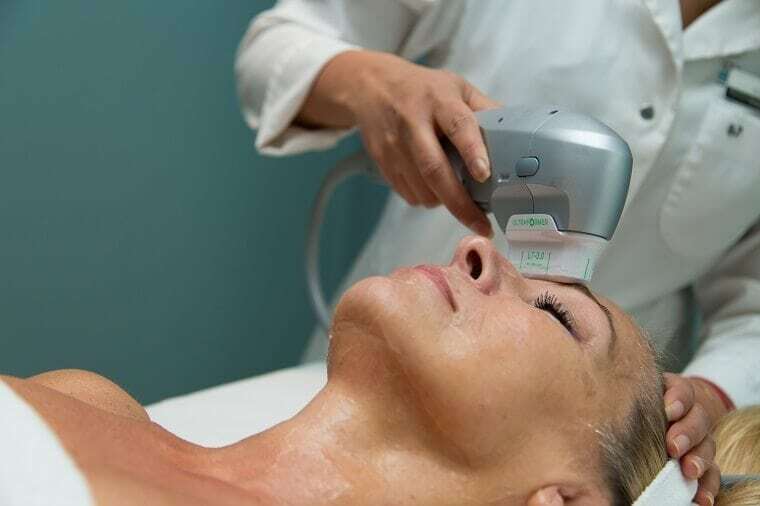 With minimal downtime and a procedure that typically lasts less than 60 minutes, the HIFU Skin Tightening treatment is the leading “non-surgical face lift.” It’s non-invasive with results lasting up to one year. With the Ultraformer non-surgical contouring system, you can be on a safe, efficient, and relatively easy path to getting a youthful face back. This process is great for tightening and with the results, you will no longer feel restricted to high neck tops! Better yet, HIFU skin tightening can be used not only on the face and neck areas, but on other parts of your body as well. Who doesn’t want to get rid of that sagging skin on your arms? You can also tighten skin on the stomach, thighs, and beneath the buttocks. The amazing technology used with the INFINI™ combines therapies which maximize the skin tightening process. The innovative 3D radio frequency and micro-needling treatment helps resurface your skin through enhanced production of the natural collagen and elastin in your skin. Pulsating micro-needles make micro-channels to deliver the energy from the radio frequency into your skin, triggering collagen production. It is a non-surgical procedure with minimal downtime which focuses on the second layer of skin (the dermis) to offer the maximum positive results possible. It is wonderful for not only skin tightening and smoothing of the skin’s surface but also for removal of acne scars and stretch marks. It can also help with reducing wrinkles and pore sizes. Micro needling the skin with Dermapen is a pain-free treatment that promotes natural skin rejuvenation which results in more even skin tone. It also aids the skin tightening process, fights sun damage, and enables a more vibrant and youthful skin glow to be restored. It can get rid of stretch marks, traces of acne, pock marks, and scars. Even after just one treatment, you will notice a difference in the way your skin looks and feels. Improvements to your skin tone will be noticeable. Four to six treatments are recommended for the majority of patients, about one month apart. When looking for ways to improve the overall look and well-being of your skin, most people seek treatments that are non-surgical. If you’d like to talk to one of our practitioners to find out what the best treatment would be to help with your concerns, then book a free consultation with us today!